When we profiled David Griffin in 2010, he had just purchased 25 Jiffy Lube stores in Colorado. The stores were underperforming, some were dilapidated, and the U.S. economy still at one of its all-time lows. Those factors created a perfect storm for Griffin to expand--but it wasn't a walk in the park. "We've spent the last three years reviving those units, and it has been a monumental task," says the 56-year-old today. Griffin says it took millions of dollars to turn around those 25 struggling locations--and the process tested both the company and his family, which is deeply involved in the business. "I'm still working right alongside my wife Joye and my three sons," he says. "We are today's family farm." The effort paid off, says Griffin. "Sales at those 25 stores had been in a double-digit dive prior to us taking them over. This year, sales are up 5.2 percent." Numbers like that are not a surprise to anyone who knows Griffin. He has a track record as a successful business operator, both within and outside of franchising. Griffin, in concert with his family and employees, "who are just like adopted sons," makes things happen. With his Colorado units back in the black, Griffin is looking for more opportunities. "We've bought out competitors, fellow Jiffy Lube operators, and built new locations. We're looking for untapped markets in our Colorado, Utah, and Nevada territories and might even consider expanding into new states," he says. "It's all about our people," says Griffin. "We are known for raising up strong leadership in our stores and that in turn builds strong stores." Griffin, along with his wife Joye, was chosen as Jiffy Lube's 2010 Franchisee of the Year and is a staunch brand supporter. He's excited about some new brand initiatives being rolled out by the franchisor and is eager to see what lies ahead. One of the things Griffin says he has learned over the years is that "Opportunity almost always never comes at a convenient time. It's staying focused on the long term and the future that makes today's opportunities work out in the end." Despite the challenges and the expense of turning around those stores and expanding his business in today's economy, it's easy to believe Griffin when he says, "I'm having more fun now than I've ever had." Joye washed windows and pumped gas at her grandfather's gas station. I hauled chains from the front to the rear of his father's car wash. Joye and I detailed cars while sweethearts in college. I spent my childhood on a farm, the son of a broke farmer. That bred certain attributes into me, living with little to nothing, not having things, being made fun of because I didn't have it. Clothes were hand-me-downs. I was the fifth child of six. I was in the 7th grade reading at a 3rd-grade level branded as attention-deficit, and there was a lady in the remedial reading course for people who couldn't read. She found I was a multi-level thinker and not attention-deficit. That was a real impressive moment. Ruth DeVries took me from the 3rd-grade level to the 8th-grade level in six months. The next one would be learning how to work for my father. My dad had a car wash. Before going to work, I'd volunteer and drive tractors and equipment, planting and cultivating crops on 130 acres owned by our church, from early morning to 20 minutes to 8. Then I'd drive to my dad's place and did it again in the evening. It cut back on my play time but increased what I call service and work time, and I found great pleasure in working for others. Then, when I married Joye 34 years ago. She's been telling me things about myself I never knew. She was the absolute making of me. 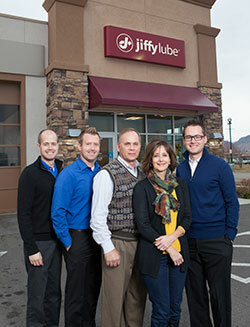 In 2007 we received the Operators of the Year Award from Jiffy Lube International. But for me, I'd have to say the greatest one came on our managers' retreat this past week. I had 51 managers there, and with passion and tears in our eyes the Griffin family got the Employer of the Year award from them. That's my biggest accomplishment. Another thing we have done in the past 3 years is finished our large project of all stores re-imaged. We have added some new stores, but the bulk of our growth has come from in-store customer increase and sales. We have spent our time developing the talents and abilities of our leaders throughout the stores, districts, and company. Remember in our last interview we had just taken over 25 stores in Colorado. When we purchased them, those stores were in double-digit decline in sales and customers. We have been in double-digit increase every year since our takeover. We have always been a company that would give throughout the years. But the last three years Joye has led us to a much more organized focus on raising funds for Make-A-Wish. This has added a heartfelt purpose to our company. The giving has lifted us all. Raising the funds to grant a wish for a child with a life-threatening condition has given us a true purpose--that is to feel the blessing of giving. We have seen the tender mercies of giving. In 2014 we will raise around $70,000 for the children. Building a full-service car wash. I built a Taj Mahal and put too much money into that facility. Building that car wash. It's twofold. The vision of building created the opportunity to introduce us to the fast lube franchise. We bought 12 stores in Northern Utah and that quickly opened other doors to buy other stores. It changes from week to week. There are weeks when I will be looking at all items on the ground level in the three states. We travel two by two. We rarely travel one at a time. We maximize talents and abilities by going together. I like to feel the pulse of the operation on the ground level. I review the stats from the previous day, week, and month. My vice president of operations is our youngest son, John. I will also spend time with Jeff, vice president over all inventories, vendors, fleets, and new acquisitions. And then I'll be reviewing things with D.J., our eldest son, who will be working primarily as our controller. And at some point I will talk with Joye. She's my wife and business partner and we will make sure that we're united on the things we want to do. I'm a farm kid. I grew up raising horses and I still have two. So I spend time saddling horses, also snow and water skiing. We play as hard as we work. Skiing, riding my horses. I don't go to the gym. My favorite stuff is a harness for my horses. The tech tools I have, but they're just tools I have to accomplish what I need to do. I most like to spend one-on-one time with my grandchildren. Strengths Based Leadership: Great Leaders, Teams, and Why People Follow by Tom Rath and Barry Conchie. We find our greatest value in our employees, and that's not just lip service. We train people on the business and bettering ourselves as individuals. Dan Griffiths of the Tanner group in Salt Lake City trained and taught our leadership for 3 days. At one point in our career in the chemical business I had another partner, and that partner's outlook was totally opposite of mine. I'm an optimist, but realistic. My glass is half full and his is half empty. I ramp up in the worst of times, he ramped down. My wife said, "You need to step back and decide to be yourself. Once you decide who you are, then you need to decide whether you need to be in that chemical business." I couldn't shed his outlook and the death spiral he was in, and that was affecting me. Her advice: Get out. My beliefs and my understanding of a greater purpose in life. How do you balance life and work? We don't keep score on one side or the other. We're passionate in the business and the same with our personal lives. We spend time as a family together, working in the religious sector, serving other people in the community. But we're not keeping score. It's a well-woven rope all the way through. "Griffin Fast Lube believes in creating valuable services for customers and enjoyable work environments for employees. To do that, a set of values and information must be known and achieved by all employees. GFL does not create a comprehensive list of rules and regulations that will guide employees through every possible situation. Rather, it hires teachable individuals, with good core values. We build off those core values and teach them how to understand and evaluate situations, so that they can make correct decisions. This type of management stimulates innovation and allows management to be creative. These values and creativity show to our customers, which then builds excitement and loyalty." Management method or style: Firm, fair, and friendly. In that order. I'm always firm. I'm always fair, and I'm friendly. You'll see managers hug me when I walk in. They'll say, "Mr. Griffin will communicate but not talk in a demeaning way to me." I'll never tear down the individual. Right now it's keeping everybody from not letting the economic downturn affect them negatively. You have so much negativity coming out from what's written and what's viewed on TV. But I try teaching them how to look at that as an opportunity instead of a downfall. My father was in the 111th Airborne. He lived through the '29 crash, the 1941 bombing of Pearl Harbor, Hitler declaring war on the U.S. It was all turmoil. He taught me about an individual named Marie who was asked to make desserts when it was hard to make food. She was a single mother raising a child, and built a bakery in '48. In 1968 she had 26 restaurants, and today what, 182? She was Marie Callender. I bought a home when interest rates were at 18 percent, car sales were down, home sales were down, and homebuilders were going broke. In 2010 interest rates were low but car sales and home sales are down and homebuilders were going broke, car dealerships were going broke. And Griffin Fast Lube was able to doubl twice in two years. The opportunities don't float to the surface unless something difficult happens. They'd say I'm an individual with a lot of passion and discipline, somebody who has the ability to care for all of us beyond the employee at work and into their homes and families. They would say when he gets a goal in his mind he can work dog-tired under extreme circumstances. I work as a team, I don't run point. I'm not that type of manager. I'm side by side with my wife through all of this. That's why we get so much accomplished. There is a Griffin in every store at least once a month. Quality products and keeping the brand united. Yes. All-day everyday low prices and coupon discounts. All of our employees are clearly communicated with as to what the job position requires and their daily, weekly, and monthly responsibilities. Their managers clearly communicate as to what they're doing right or wrong, and their job is to teach them along the way how to get better. If you find someone resistant or negative or foul-mouthed, if they don't move on they won't be able to stay with us. We're firm, fair, and friendly. By the same token, we're very careful about who we hire. These aren't just bodies coming through the door. We have a training program tied with Jiffy Lube's program. Everyone gets certified on the customer side and the procedure with the vehicle. Clear communication verbally and then written up. A key point: we follow back up with training in their area of default. How many stores we've added and where's the targeted area for our next 2, 3, 4, 5 stores. Improving the footprint overall. Improving the talents and abilities of the management team. We're always evaluating the customer experience. First and foremost, have all the stores reimaged with all buildings having the same new-age Jiffy Lube made clear. I want a better-trained employee working in a new and improved facility. Even if we do not get any opportunity to open other markets, we can still add 25 to 30 more locations. Our employees have been inspiring us as a corporate team and customers feel the inspiration as well. The stats verify that. We're one of four front-runners for Jiffy Lube International. We're climbing, and that filters down into our customers. I've seen a kind of a settling in the market. We've had a lot of car dealers close, and it's lifted us. But I don't think we're going to see any more major turnovers. People are starting to get their feet underneath them again. What did you change or do differently during the economic downturn that you are continuing to do? We got more aggressive. When others duck their heads, we lift ours. Forecasting becomes a little hard to determine if you look at it in broad geographic areas. When you drive around and identify a need in a county, then it becomes clear. Statewide, it's hard to apply it. You have to break it down into a county, get in a car, and go with your people. Then you can see what you need to do to lift your market. No. Aside from opportunities from Jiffy Lube and Shell, our internal cycle comes from savings and we don't even approach the bank on those items. If you wanted to acquire just the franchise and lease the facilities, very few banks right now, if any, would even consider that. The banking industry is not built to loan money on a straight franchise unit. You need dirt, brick, or mortar. That comes as a result of developing trusting relationships with your franchisor and your suppliers. For the most part banking and loans are difficult or nonexistent. Your greatest opportunity is to have a trusting supplier and franchisor. Have you used private equity, local banks, national banks, other institutions? Why/why not? We have used some lightly. Our management team participates in profit-sharing from the locations they operate for us. We provide them with a clear understanding of the profit-and-loss statement. How are you handling rising employee costs (payroll, healthcare, etc.)? We're paying for health insurance. At this point the biggest thing in a down economy is to lift the quality of our overall employment. There's a lot more unemployed and we can be a little more selective and we can upgrade, become a better performer. By hiring better we can improve our situation. We evaluate key focal points for each manager and assistant manager and we do a lot of "attaboys" when we're out there. We make sure to recognize them in the leadership retreat. This business of ours is driven with a heart and soul of a family spirit. Joye and I have worked for three decades. With our sons D.J., Jeff, and John, their added leadership has allowed us the ability to keep growing. I hope with this we can shed light that this company is and has been a family success story. Growth in difficult times comes from a united family making difficult choices, staying still in rough storms of growth. Thanks to my family. I look forward to many more years of success.